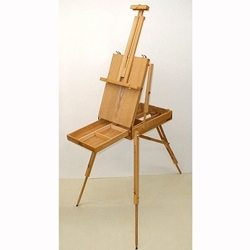 Full Box French Style Easel - An affordable French style easel imported from China. Compact, sturdy and convenient, the French style easel is the most popular travel easel-carrying case ever made. Holds canvases up to 34-1/2 inches. Weighs 10lbs 2 ounces. This easel is UPS-able to anywhere in the 48 contiguous States for only $14.95.